Advantages: Great photos of some rare subjects; very attractive profiles by Tom Tullis; helpful captions. 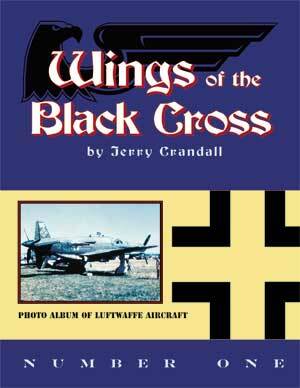 Eagle Editions has launched a new series of Luftwaffe Reference books called "Wings of the Black Cross". Number One is presented inside a soft cover, with 36 glossy pages enclosed. The book wastes little space. It is packed with around 67 black and white wartime photos, plus three colour photos on the cover and eight colour profiles by Tom Tullis. Each page has four or five large photos. Definition and detail of all of these photos is very good. A good selection of subjects is covered, with about half the photos depicting late model Fw 190s and Bf 109s, and the remainder capturing Ju 87 Stukas, Bf 110s, a Ju 88 and Ju188, a rare Ta 154A-1, various Arado Ar 96s and Me 262s, and a Mistel S 2 combination. Most of the photos have been taken by servicemen of abandoned or wrecked aircraft. Most of these are quite close to the subject, and offer the modeller a wealth of detail on colour schemes and airframe characteristics. The captions by Jerry Crandall are useful to modellers. Many include observations about the colours and markings of the pictured aircraft. Tom Tullis' artwork adds even more inspiration to the mix. The subjects all appear in at least one photograph in the book, and I think we can assume that we will see decals of some of these too! Luftwaffe fans will find plenty of interest in this new series.